Nothing is more special than spending an evening eating a delicious meal with a group of friends. But if you’re super popular, a small get together often turns into quite the affair. For my last birthday, what was supposed to be a simple dinner with 4 friends became a party of 12; not due to my popularity but due to the fact that I have a compulsive need to invite everyone I see. We had a great time with lots of laughs, even if we had to wait two hours to be seated. In good news, you can avoid this wait time, and other unwanted hassle that comes with going out with a large group. Here are some tips and tricks to do just that. Done correctly, it will bring your whole circle closer together and maybe even spark some new friendships. Nothing is worse than showing up to a restaurant and having to wait to be seated, especially if the waiting area is packed. This isn’t usually a big deal when you’re out to eat with 3 or 4 friends, but with a group of 10-15? There probably isn’t enough room in the waiting area to begin with! This may seem like common sense but when you’re planning an outing with 3 friends and it becomes 10, it’s easy to forget when you’re trying to get everything else sorted in a hurry. It never hurts to call ahead to make a reservation, and will ensure your table is ready and waiting when you arrive. Sure, you can never please everyone and it’s pretty much impossible to find a place and time to fit everybody, but if 5 of your group of 10 have yoga class at 6:00, 6:30 is probably not a good time for your reservation. An easy way to find a time that works for everyone is to use a doodle poll! Your friends can select which times work for them and it will be clear to you which time is the best time. Everyone will be in a much better mood if no one is in a rush, so a convenient hour for most people is important, emphasis on the word “most”, it’s near impossible to find a convenient time for everyone in a large group. Wish you had a way to discuss the event with all of your friends at once without having to be in the same place? There’s an app for that! Actually, there’s several. No matter what group messaging app you’re using (Facebook messenger is my personal favourite), group chats make it much easier to communicate plans and work around issues that arise. Also, some group chat apps allow you to create an event within the group with a date, time and place! If you find group chats a little overwhelming, consider making a facebook event or group instead. Just ensure that you have a way to communicate with everyone at once. When it comes to a large group of friends, odds are someone has an allergy, or is vegetarian, or is gluten-free, or is lactose intolerant, etc. As an example, in my group of 5 friends, we have one vegetarian, two of us are lactose intolerant, one of us is allergic to nuts, and there’s a red dye sensitivity. A lot of food requirements for just 5 people, imagine a group of 15! Like I said before, you can never please everybody, but it’s important to make sure no one is in immediate danger due to an airborne allergy or other circumstance. Try to find a restaurant that has a least a few options for everybody (online menus are really handy for this!). Another thing to note is if someone has a peanut allergy, call ahead to see if the kitchen uses peanut oil in their friers. Something not very many people think of but could seriously limit a friend’s meal choices. Not only is this a great way to cut down on fuel emissions, car-pooling allows your friends to get to know each other better before the event, and can spark a great conversation that will continue over the dinner table. If 10 people are going out to dinner, there’s no need for 10 cars to come too! Discuss in the group chat who can drive, and who wants to go in which car, and odds are some friends will show up already chatting and laughing. Not only is this hard on the server but also hard on other diners as well who will have increased wating time. A simple fix to this is before you call over the server, ask around the table to see if anyone else needs anything. Then your server can get all of the extra bread, napkins, ketchup and other requested items in one trip. This saves you more time to be involved in the conversation and spares the server from seemingly endless trips to the kitchen. Going out to eat should be a fun experience. Sure it can be a little bit stressful ensuring everyone has a ride and finding a time that works for everyone, but it will be all worth it when it comes together. Nothing is better than spending time with great food and even better friends. 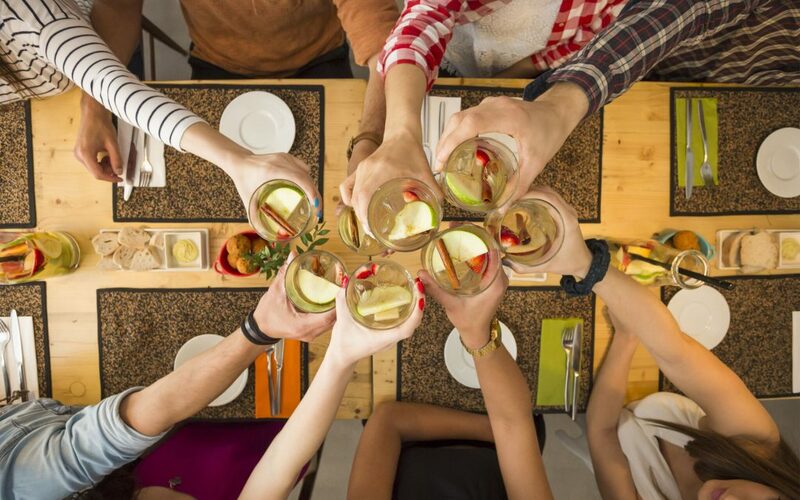 Feel free to comment any tips or tricks you find useful to improve your restaurant experience when dining with a large group! HelpMeOrder is a dish ratings app that lets you show off your exquisite taste, see recommendations from the people around you, select your favourite dishes and discover hidden culinary gems. Become the best food critic in town. Available for free on the App Store and the Google Play Store today! Julie is an engineering student, singer, marine conservationist, ukulele enthusiast and lover of all things food related.